Worcester forward Pierce Phillips is to leave Sixways this summer to join French Top 14 club Agen. The 26-year-old ex-Jersey Reds lock, who is in his second season with the Warriors, has signed a two-year deal. "Pierce has been a valuable member of our squad," said director of rugby Alan Solomons. "He'll no doubt play a vital role until the end of the season." Agen are currently 12th in the Top 14, one place above Grenoble in the relegation play-off zone. 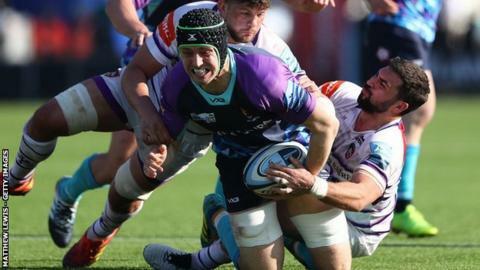 He is the second English lock to join a French side for 2019-20, following Clermont Auvergne's signing of George Merrick from Harlequins. Meanwhile, Worcester have confirmed that Ireland-qualified South Africa-born prop Gareth Milasinovich is also to leave Sixways this summer to join Ulster, in the hope of furthering his international ambitions. "Gareth has made a valuable contribution to the team during his time here at Sixways," said Warriors director of rugby Alan Solomons. "Although we are sorry to see him go, we appreciate that his move to Ulster affords him the opportunity to challenge for international honours."